We arrived at Bolton Castle on a very misty October morning, the castle rose from the gloom and looked spectacularly spooky. I turned the big ring door knob and entered into the tearoom which was warm and inviting, with the smell of coffee and cakes, but was slightly concerned about the fumes coming from the free standing gas fire. The castle was humongous inside. As we walked through to the courtyard we heard a man shouting extremely loudly, "When I say stand still I MEAN stand STILL!" He yelled at a dozen medieval peasant children who were wearing tin hats and carrying spears above their heads, the kids were marching up and down on his command. Just as we walked passed them, all of a sudden they shouted "ARSE ABOUT FACE" turned and stood to attention facing us, we had our backs against the wall and didn't dare move ! Chuckling to myself, I tiptoed out of the way quickly realizing we were in the middle of kids medieval military training hehe. We walked through the depths of the castle, we found the dungeon with the obligatory oubliette, we couldn't decide if it had been blocked off with dark mesh or it was really that DARK, so we decided to throw sticks and stones down to see if we could hear them hit the bottom, yes they did after a few seconds, I’ve never seen anywhere so dark, it was solid. 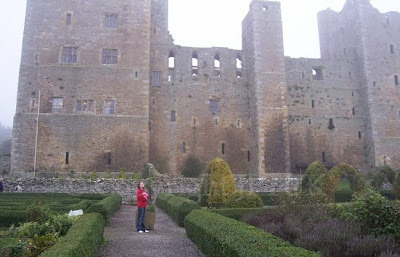 We walked around the great hall, it had large tapestries on the walls and one lone knight stood in the corner of the room. Mary Queen of Scots apparently used to complain about the cold floor on her feet in the castle of which she took a great disliking. She was imprisoned here by Elizabeth I, but she had 51 servants to look after her ! We went up into the bedrooms, the one with the mannequin of the queen and her servants, I took a photo and there is a light anomaly above the queens dummy. 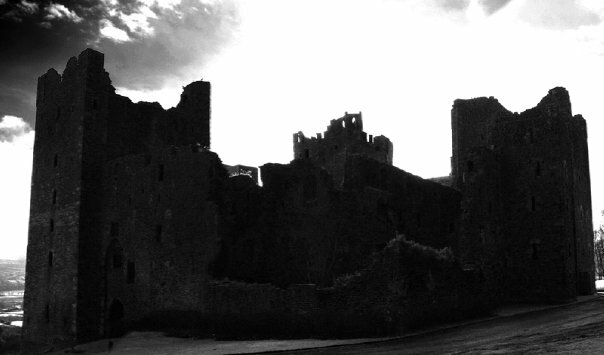 It is well known that her shade walks the corridors and also has been seen outside the castle. 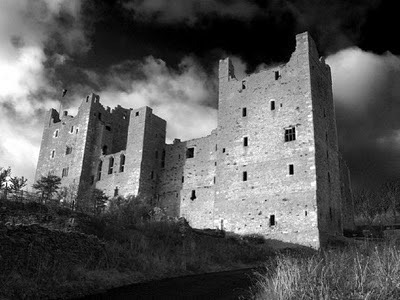 Bolton Castle, Wensleydale, North Yorkshire. The ghost of Mary Queen of Scots has been spotted in the courtyard wearing a black velvet dress.